This is a model of a differential mechanism, a fundamental part of any car that has only one engine (including all gas-powered cars, all hybrid cars, and some electric cars). The differential solves the basic problem of how to have a single engine and drive shaft power two wheels, when those wheels sometimes have to turn at different speeds. Any time a car is going around a corner, the outside wheel has to travel father than the inside wheel, which means it has to turn faster. Having the tires slip on the road is not an option, but fortunately the clever arrangement of four gears in the center of the differential can deliver drive power to both wheels, while allowing each one to turn at its own speed. An optional Electric Motor Add-on, sold separately, can be installed to replace the manual crank. 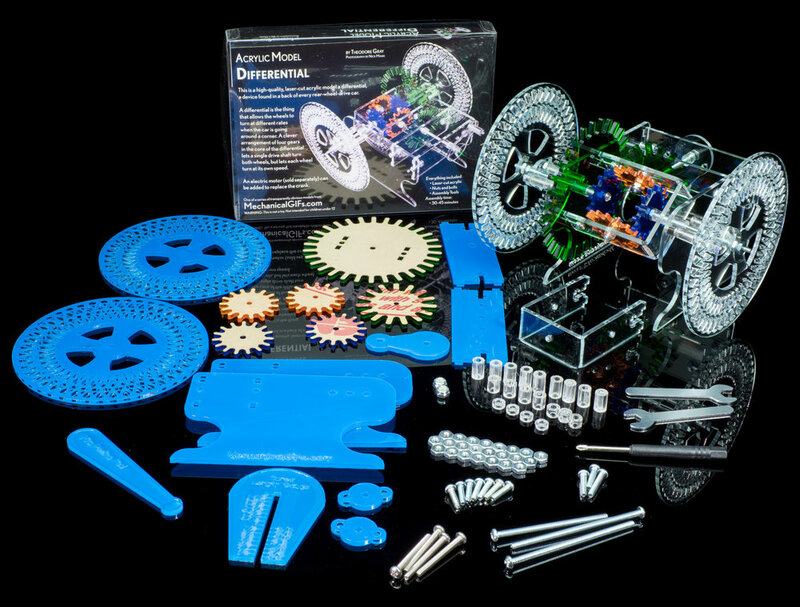 This kit is available as a stand-alone model, and the core of it is also included in our Radial Engine Car model. Your model will arrive attractively packaged with all the necessary parts (including a screwdriver and two wrenches). The kit screws together in about 45-60 minutes, and does not require any special model-building skills. A detailed, step-by-step assembly video is available on our instructions page.